The landmark Citizens United ruling in 2010 significantly reduced regulation on political spending in the United States. As a result, the market for political advertising in the United States has increased at all levels of government since then. The new legal framework has empowered advocacy groups, particularly political action committees (PACs), to spend more money than they were previously able to legally use for advertising. The composition of political advertising expenditure is also quite diverse. Candidates and advocacy groups are spending more money on digital political advertising while still using traditional media such as radio and broadcast television. Every four years, the presidential election incites more political advertising spending than any other race. In the summer of 2016, while the Republicans were regrouping after a divisive primary, conservative PACs such as Priorities USA Action and Rebuilding America Now PAC aired a number of advertisements for the 2016 presidential election only surpassed by then-established candidate Hillary Clinton. The U.S.’s Electoral College, in which the presidential election is decided by winning states rather than a popular vote, leads to more advertising in “swing” states. These states, such as Florida and Ohio, are evenly split between Republicans and Democrats. As a result, more advertising dollars are spent and a larger volume of ads are aired in these states. 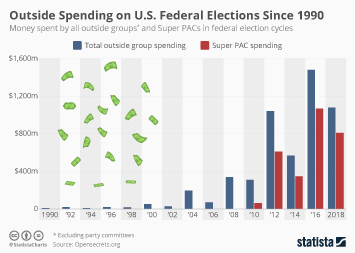 Spending on political advertising seems to match what influences voter decision. In general, TV ads had the power to influence more voters to take further action, research and discuss the candidates, followed by TV news sites and social media. The latter source, together with digital platforms is even more effective than traditional outlets in sparking the interest among younger voters. The risks of this shift towards digital advertising became apparent in the 2016 U.S. presidential election, where Russia was accused of placing political ads in an attempt to change the election outcome. As a result, the level of trust in advertising on Facebook, Twitter, and Google decreased significantly. With evolving challenges in the regulatory and technological environments, some advertisers are seeking niche markets such as LGBT communities and altering tactics to convey their messages.